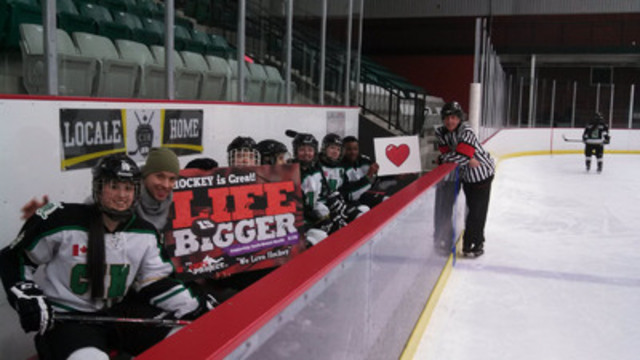 Filmed in early February at the Canadian International Hockey Academy (CIHA) in Rockland, Ontario, the music video’s cast of film makers and eighty (80) young hockey athletes from eleven (11) countries are all trying to send the world a mental health awareness message wrapped in the metaphors of hockey and love under the campaign banner Hockey is Great. LIFE is BIGGER! The final-cut version is available in broadcast quality and on YouTube beginning on February 20th. Click below to view it now, on view it on the home page of TheHockeyProject.ca. The powerful and emotional pre-release promo video can also be found at the project’s website. www.TheHockeyProject.ca. The promo captures preparations for the shoot and images of the CIHA students sharing Pegg’s moving story of losing his daughter to suicide. His presentation took place on January 28th (Bell Let’s Talk day). As the globally-recognized nation of hockey, and because of the Sochi world-stage, Pegg believes there is real potential for Canada’s athletes to reach out to and engage many at Sochi. He’s asking Canada’s athletes and the world of hockey to lead on this issue.